To collect high quality clinical and epidemiological data with repositories for neuro-imaging, DNA, and serum from patients with TBI. To refine and improve outcome assessment and develop health utility indices for TBI. 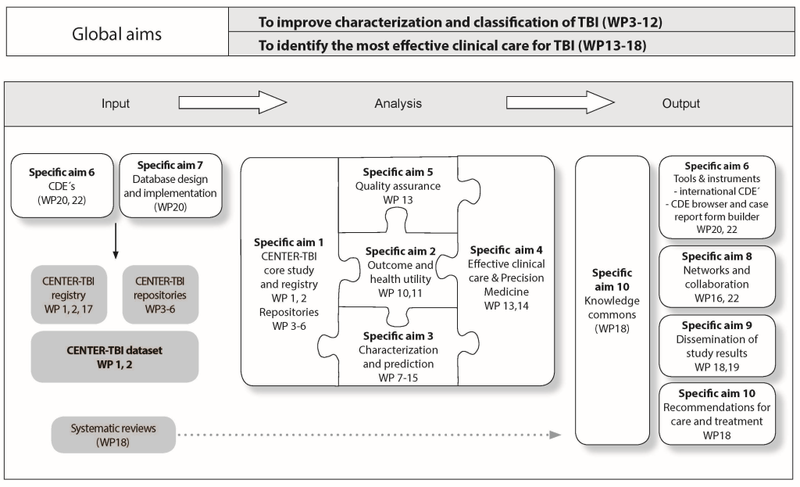 To develop multidimensional approaches to characterisation and prediction of TBI. To define patient profiles which predict efficacy of specific interventions ("Precision Medicine"). To develop performance indicators for quality assurance and quality improvement in TBI care. To validate the common data elements (CDEs) for broader use in international settings, and to develop a user-friendly web based data entry instrument and case report form builder. To develop an open source database compatible with FITBIR. To intensify networking activities and international collaborations in TBI. To disseminate study results and management recommendations for TBI to health care professionals, policy makers and consumers, aiming to improve health care for TBI at individual and population levels. To develop a "knowledge commons" for TBI, integrating CENTER-TBI outputs into systematic reviews.